Brown 2 pds of ground beef & 1 chopped onion. Drain. Add 1-4oz can green chilies, 1-8 oz jar of salsa, 1 can of cream of mushroom soup, 1 can of cream of chicken soup & 1 can cheddar cheese soup. 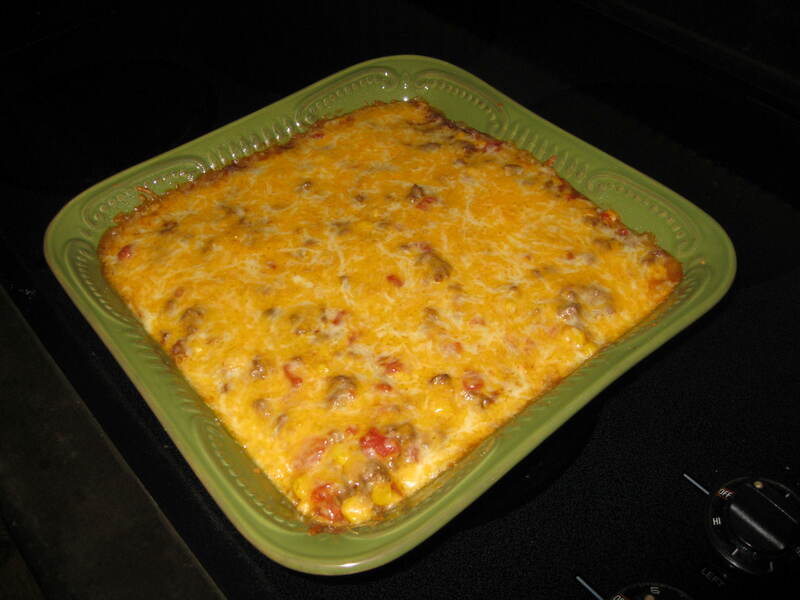 In a 9 x 11 inch baking pan coated with cooking spray layer corn tortillas (cut in half) topped with 1/2 of the meat mixture. Repeat & sprinkle with shredded cheese. This entry was posted in Beef by Modern Mom Meals. Bookmark the permalink. it doesn’t give you a cooking time or temp?? Looks wonderful and I have just started to prepare and realized these things where missing. Heather, you can just heat until warm and the cheese melts. Enjoy.